Reader Marcello Kato requested a song analysis of a big hit by Yes from 1983 - "Owner Of A Lonely Heart." The song is still the biggest selling single ever by Yes and was off their extremely successful comeback album 90125. This was the first album with guitarist/singer/writer Trevor Rabin in the band and continued an amazing string of hits by producer Trevor Horn. As with all song analysis, we'll look at the song form, the arrangement, the sound, and the production. The coolest thing about this song is the way it's arranged. Every time a section repeats, there's something a little different that happens, usually because of the fills between the vocal phrases. The interludes are comprised of song parts that are featured just a little differently from when they were used in the verse or chorus. * The Foundation: The bass and drums. The bass is doubled with a normal or baritone guitar. The snare is doubled with a tambourine in the bridge. * The Rhythm: Mostly comes from the high-hat as there are no dedicated rhythm instrument parts. * The Fills: Electric and acoustic guitars, bass, synths, samples, background vocals. If there's a spot open, there's a fill. As most hits do, "Lonely Heart" develops as it goes along. The second verse gets bigger with a distorted guitar doubling the bass line, and a series of stereo fills between the vocal phrases. The 3rd guitar solo verse goes back to sparse then builds to a bigger out-chorus and bridge. It's all tension and release, and development. Trevor Horn-produced records are always state of the art sound-wise, more because of the sonic layering of the mix than anything else. In "Lonely Heart," the layers really show. The drums are rather small and mixed in mono (!) with a very light gated reverb on the snare. The vocals have a very long time-delayed reverb that give it that sense of space. The guitars are pretty much up front and in your face with only a very short room reverb. The guitar solo is interesting in that it sounds like a guitar synth but is just a regular electric guitar compresses very heavily, according to Trevor Rabin. Interesting sound nonetheless. Like all of Trevor Horn's records, the production is outstanding. The big things count, but it's the little things that really make it. Listen to the second verse and note the fills between the vocal phrases. They're all in stereo in some way so there's always some movement from right to left. The way parts are layered, like the fill line in the chorus with a guitar and keyboard, is also very cool. Perhaps my favorite part from the first time I ever heard this song is one of the smallest. The bass part never changes in the verse or chorus of the song except for one time. That's in between the first and second outro chorus where the second half of the phrase is changed only slightly, and is then answered with a distant bell-like synth. Then in the outro, a note is intentionally left out of the bass and kick drum part leaving a very obvious, but musical, hole. Very cool! Many things are unfair in life. The 99% work harder than the 1%, but get compensated far less for that work. Financial engineering pays far more than real engineering. And then we have music, which isn't fair in the least. Here's a list that comes from Buzzfeed that just about says it all. 1. 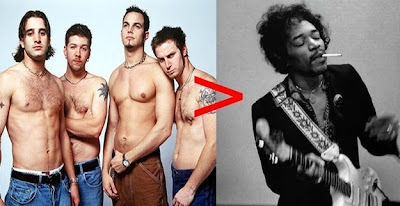 Creed has sold more records in the US than Jimi Hendrix. 2. Led Zeppelin, REM, and Depeche Mode have never had a number one single, Rihanna has 10. 3. Ke$ha's “Tik-Tok” sold more copies than ANY Beatles single. 5. The Black Eyed Peas' “I Gotta Feeling” is more popular than any Elvis or Simon & Garfunkel song. 6. Celine Dion's “Falling Into You” sold more copies than any Queen, Nirvana, or Bruce Springsteen record. 7. Same with Shania Twain's “Come On Over." 8. Katy Perry holds the same record as Michael Jackson for most number one singles from an album. 9. Barbra Streisand has sold more records (140 million) than Pearl Jam, Johnny Cash, and Tom Petty combined. 10. People actually bought Billy Ray Cyrus' album “Some Gave All…” 20 million people. More than any Bob Marley album. 11. The cast of “Glee” has had more songs chart than The Beatles. As I stated in a post the other day, one of the cool things about the new Pro Tools 10 is that it finally has a feature known as clip-based gain. That beans that the level of each clip can be independently changed without having to resort to automation. PT competitors have had this for years, but Avid/Digidesign is only getting this out to their user base now. Here's a video that explains just how useful clip-based gain can be. It's surprising just how important the material that a speaker cabinet is made from is to the sound. Here's an excerpt from The Ultimate Guitar Tone Handbook that describes just how great a factor the construction material really is. "The type of wood used for building a cabinet contributes to its tone. Cabinets, like guitars, can be built out of just about any kind of wood. 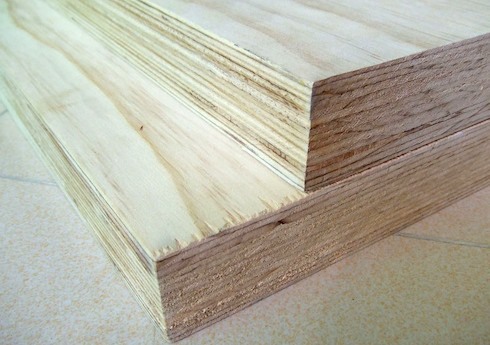 But just like guitars, just a few kinds of wood are used because of their sound or cost. Marshall cabinets are built out of 11 ply Baltic birch, a wood that’s known for its strength and light weight. This is one of the reasons (besides the speakers and the closed back) that nothing else sounds quite like a Marshall cabinet. Other manufacturers also use birch, but some use the cheaper and thinner 3 or 5 ply, which compromises the sound. 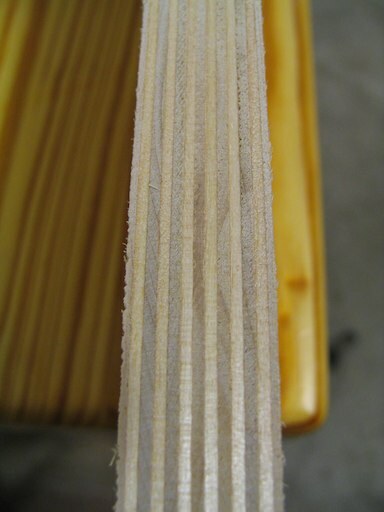 Others use 13 ply birch to make the cabinet more robust in transport, but heavier as well (see the graphic on the left). Early Fender cabinets were made of pine (see the figure on the left), which is light and has it’s own tone. Pine was inexpensive, easy to get, but it wasn’t the strongest wood, which was a negative for the gigging musician. Like most manufacturers, Fender slowly but surely changed their cabinet wood, first to marine plywood, and then particle board (known as MDF - medium density fiberboard). MDF is very strong and inexpensive, but contributes is somewhat neutral sounding at best, and harmonically dissonant at worst. 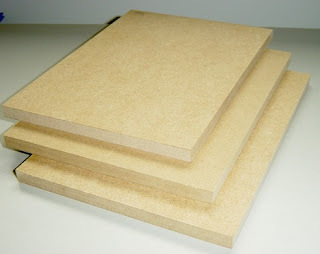 Today, most manufacturers (even Fender and Marshall) use MDF for their inexpensive cabinets, and birch or birch composite for their more expensive or vintage cabinets. (see the figure on the left) That’s why you can have two cabinets from the same company loaded with the same speakers, yet they can sound completely different. Plywood and MDF has less cabinet resonance than solid woods like pine, cedar and birch. The resonance is what contributes to the “warmth” of the sound, but can also be responsible for blurring the notes because of the slight absorption of sound. That means that the sound coming out of a pine cabinet may be full and round, but it won’t project as well as a cabinet made of plywood. Baltic birch is chosen because of its musicality, although it’s not quite as resonant as pine although it does have a bit harder edge. The resonance that occurs with MDF is described as “dead” and “atonal.” Anything that adds color actually wastes a bit of the speaker output since some of the energy vibrates the wood instead of the air. Sometimes cabinets were designed out of necessity instead of a grand tonal design. In the case of the famous Marshall 1960 4x12, the cabinet was built as a way to contain the four Celestion G12 speakers, which were cheap and plentiful at the time. These speakers were rated at just 15 watts and were prone to flapping on hard hit low notes, so the closed back cabinet helped limit the cone travel because of the air suspension, and having four speakers kept the amp from blowing them out." Here's a great video with drummer extraordinaire Greg Bissonette describing the drum groove that he's developed to make sound checks go a bit faster. The idea is to give the engineer everything he needs to check each of the drums and cymbal mics, but in a musical way. I've found that almost all experienced session drummers have a similar groove or routine that goes way beyond the boring 20 minutes of "Give me your kick drum" while the drummer bangs away on just a single drum. While some of that is necessary, everyone appreciates a groove that more closely simulates a song rather than an exercise.